Matching into residency was one of the greatest days of my life. Years of hard work and dedication had finally culminated into the opportunity to become a doctor and practice medicine where I wanted, and in the specialty where I fit best. A few years into being a resident, the process started over, with the fellowship application process. In almost every field of medicine, there are opportunities to subspecialize, and fellowships are one such opportunity. Fellowships are a way for residents to specialize in a specific area of medicine or surgery. For example, if an internal medicine resident wants to become a cardiologist, he or she typically has to complete three years of residency, followed by three years of fellowship in cardiology. The same applies for other subspecialties — a pediatric resident who wants to specialize in taking care of sick neonates in the ICU would complete a neonatal ICU fellowship. 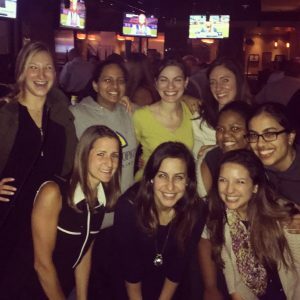 Over the summer, I had the opportunity to travel around the country with some of my greatest friends and colleagues within the Johns Hopkins Department of Gynecology and Obstetrics as we interviewed for fellowship positions in four different specialties: gynecologic oncology, maternal-fetal medicine, reproductive endocrinology and infertility, and urogynecology. Cumulatively, we received over 100 interviews. This fall, we met out matches and will be traveling far and wide to fulfill our dreams. Typically, gynecology and obstetric residents either decide to subspecialize in a fellowship or continue their career as a general Gyn/Ob. In a study looking at residents who chose to subspecialize, data from 2012 showed that around 20 percent of residents apply for fellowship. Considering seven of Johns Hopkins’ nine residents applied for fellowship and 100 percent matched for competitive fellowship with acceptance rates averaging about 69 percent, we matched very well this year! Although my colleagues and I applied for a variety of subspecialties at many different institutions, in reflecting on why we each chose a specific career path, three things were consistent. We picked these specialties because of the “patients, procedures and problems,” and the way our careers will allow us to interact with and influence all three. Ultimately, I chose to become a gynecologic oncologist because I love the patients, the procedures are inspiring, and the problems presented in treating their illness are challenging and complex. The fact that all of the residents and one fellow who applied into these subspecialties were placed in competitive fellowships is a testament to the success of the Johns Hopkins residency program in training future gynecologists and obstetricians. 3, 2, 1, match! Watch Match Day 2016 at Hopkins. Meet five of our remarkable medical students that matched, and learn what brought them to call Johns Hopkins their home.